“We’ve had enough” is the phrase on everyone’s lips as – against all expectations – the wave of strikes, blockades, disruptions and mass demonstrations begun on May 17th continues to develop throughout France. Indeed, in the past couple of days, two new strategic groups of workers have joined the protest. Technicians at France’s nuclear power plants are now cutting back on production of electricity, and the railroad workers have massively joined the street protests while cutting back on trains. Meanwhile, there are long lines at the gas pumps as petroleum workers continue to blockade France’s major oil refineries. Surprisingly, most French people take these inconveniences in good humor, and the polls show broad public support for the movement’s goals and even its disruptive tactics. This popular sympathy is all the more surprising given weeks of blanket negative media coverage, hysterical official statements and police tactics designed to discredit the movement. First the issue was the violence of the “casseurs” (wreckers) on the fringes of the big, peaceful, well-organized mass demonstrations, and the image of one flaming police-car in Paris kept popping up on every channel for days. Then came the threat of the unions (government-subsidized and generally cooperative) taking over the country and destroying the economy. Next, the talking heads topic of the day the police, what a great job they do and how we should support them! 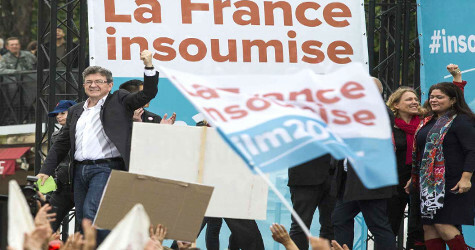 Despite this propaganda campaign, the popular movement continued to grow and public sympathy with it, to the point that the governing Socialist Party split – making it impossible for the François Hollande administration to push its unpopular Labour Reform Bill through the parliament. The government, which had earlier made a few compromises, became afraid to give in to the majority and loose face, so it evoked paragraph 49-3 of de Gaulle’s tailor-made Constitution giving the President the power in emergencies to impose laws by edict, without a parliamentary majority. 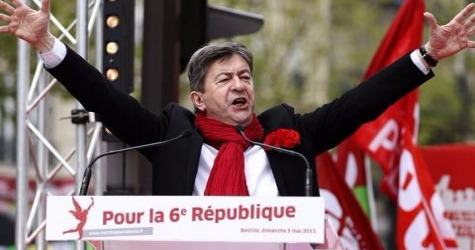 This high-handedness was the last straw for the democratic French, who had come to detest the anti-labour “reform” bill and the already-unpopular neoliberal “Socialist” government that was shoving it down their throats. That’s when all Hell broke loose. Don’t ask me to explain the bill, except that it is part of a Brussels-imposed, Europe-wide economic liberalization plan and that it makes it easier for managers to fire workers, close plants, flexibilize work schedules, and cut back on overtime pay and severance pay. Most French people don’t understand the technicalities either, but with shrewd class awareness, they understand that the “reforms” are an attack by the 1% on the protections and regulations they have fought for over generations. They instinctively see them as another attempt to dismantle the Social Republic, officially so named in the Constitution of 1945, written at the time of the Liberation when the collaborationist French industrialists and their political tools were in disgrace while the slogan “from the Resistance to the Revolution” was still hanging in the air. Today’s struggle is, of course, a defensive battle, and so far there have been only a few barricades (blockading the oil refineries) – barely recalling the revolutions 1789, 1830, 1848, 1871 and the general strikes of 1936 and 1968. But apparently the rebellious instincts and radical temperament of the French working people have not changed all that much. Indeed, in 1995, there was also a weeklong runaway national strike among the workers in the public sector, sparked by an earlier government attempt at liberal “reform,” but according the accepted wisdom in media and governmental circles, the French people had by 2016 supposedly evolved, become “normal,” and now accepted liberalization as necessary and inevitable like every other nation. Guess not. I am happy (if somewhat ashamed) to report that I was overly pessimistic and somewhat hysterical in my last reports from France, evoking the specter of a coup d’état and possible ‘civil war’ in reaction to Hollande’s imposition of the State of Emergency and indiscriminate police raids after the terrorist attacks. So far, the Hollande government has refrained from evoking the State Emergency in today’s bras de fer (arm-wrestling contest) between a weak government trying to look tough on one side and on the other the combined forces of a young generation that sees itself being sacrificed on the alter of neoliberalism, an organized labour movement responding to militant pressure from below take a stand, and an independent-minded public that has ‘had enough’ of being manipulated. Whatever the outcome of May Madness, one thing is clear. There is a new radical awareness on the rise in France and with it a new revolutionary generation that correctly sees that it has no future to look forward to under capitalism. 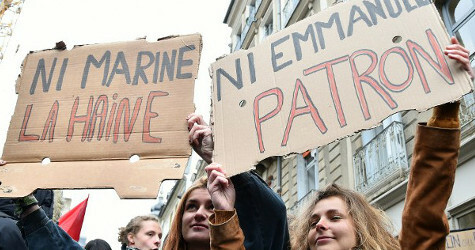 Student agitation, especially in the high schools has been boiling up across the country for months as have the nightly popular assemblies in the squares of Paris and a half-dozen other cities, known as Nuits debout (Stay up all night). These assemblies correspond to a rejection of the pseudo-democracy of the professional politicians and a desire for real participatory democracy and human community. They also function as hothouses for radical ideas, like “Occupy” and the Indignados of 2011. This intellectual revolution has only just begun, and it is likely to have a long-term effect on consciousness, just as “Occupy Wall Street” (minuscule in comparison) seems to have had on U.S. consciousness. 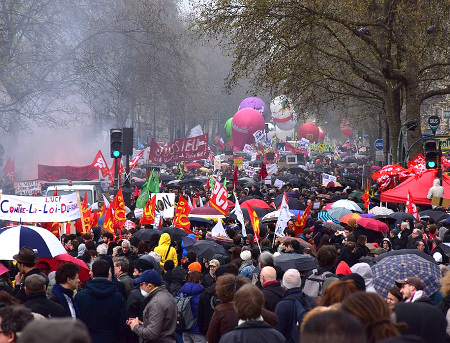 Meanwhile, the French are not only debout (standing up) talking all night, they are also standing up for themselves and for all of us in the streets and on the picket lines – standing up against the 1%’s relentless attacks on our living standards, on our rights, and on our lives. Maybe there is an alternative. 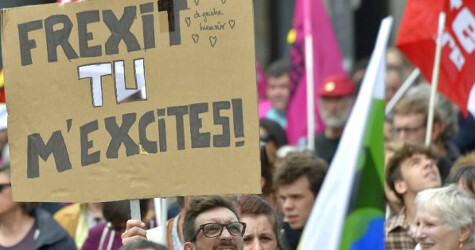 So allow me to conclude this report by translating a few excerpts from interviews recorded during the big demonstration here in Montpellier (May 26) and then close with a translation of the 2016 Platform of one of the Commissions of the Paris Nuit debout at the Place de la Bastille. “I’ve been going out in the streets for two months and at the same time actively participating in the Nuit debout. The two are linked; it touches me to see these young people who refuse to be a new consumer-generation, who would rather come together, think and discuss the future. I am reliving my 18th year and May 68. Its important to be out here; it shows that we are present and that our disagreement with the government is visceral. But that isn’t enough, as our leaders are deaf. They want to make us believe we are a minority, but I see the workers from my office marching. And whatever the profession, the salary, the same malaise and the same unease are found everywhere! I’m sorry I have to say this, but obviously under these conditions I can only approve of the blockade, it’s the only way we can change the power relationship and be heard. I’m even ready to go in myself and to tighten my belt for that. Hiring the 6 million unemployed by adding one new job for each existing job. A 25-hour week and an adjustable work schedule. Raise the minimum monthly salary to €1,500 ($1,700); a minimum of €1,200 ($1,350 for retirement, student scholarships and unemployment benefits. Public transparency of all salaries; male/female equality of salaries, open the books of all business enterprises. Maximum income ceiling set at 4 times the minimum. Free health, schooling and transportation. Requisition of empty housing, abolition of rents and guaranteed right to housing. Expropriation of the great fortunes, abolition of private property of the means of production and exchange, direct collective self-management of enterprises. All power to the Assemblies of workers/inhabitants for planning production on the basis of social needs and ecological imperatives. Election of delegates with limited mandates and the permanent right of revocation of Assemblies. Free Federation of industrial unions and residential communities. Regularization of undocumented people and international cooperation of workers’ powers against underdevelopment, imperialism and war. Not much change in situation here in France. A long drawn out ‘arm-wrestling’ struggle. Typical of the bureaucratic unions, especially the most ‘militant’, the historically communist Confédération générale du travail (CGT), who’s goal is not to win a victory for the working people but to re-affirm their power as the ‘legitimate’ intermediary between the workers and the government. So instead of uniting the different branches in a single, open-ended general strike, they space out partial confrontations to demonstrate their control and force the government to include them. The students are into finals right now, so there is not that much activity on the youth front, but Nuit debout continues. And the pressure from below continues. The demonstrations are less controlled by the unions and at the end some people may hold a General Assembly or march off in a spontaneous demonstration. Meanwhile, thanks to videos and cellphones, the the evidence of blatant police brutality and especially of police provocation (undercover cops trashing shops, etc) is really public knowledge. And everyone knows they are acting under orders from the Socialist government. The police have been reported filtering these black-cowled angry young men through their lines, where they have clashed with GTU union monitors; and somehow they never get arrested. Some have been revealed as actual undercover cops. “France at ‘War’,” by Richard Greeman. “A Montpellier: «Les blocages, c’est notre 49-3 à nous»,” by Timothée Aldebert. Richard Greeman has been active since 1957 in civil rights, anti-war, anti-nuke, environmental and labour struggles in the U.S., Latin America, France (where he has been a longtime resident) and Russia (where he helped found the Praxis Research and Education Center in 1997). He maintains a blog at richardgreeman.org.